Place eggs, yolks, flour and milk in a bowl. Using a whisk, mix to a smooth batter. Heat a non stick frypan, spray lightly with oil. Pour in some batter and swirl the pan around to evenly and thinly cover the base, cook until lightly browned before turning. Cook other side until lightly browned, set aside and repeat the process until all of the batter is used. Peel and cut the pineapple into chunks and place into a bowl. 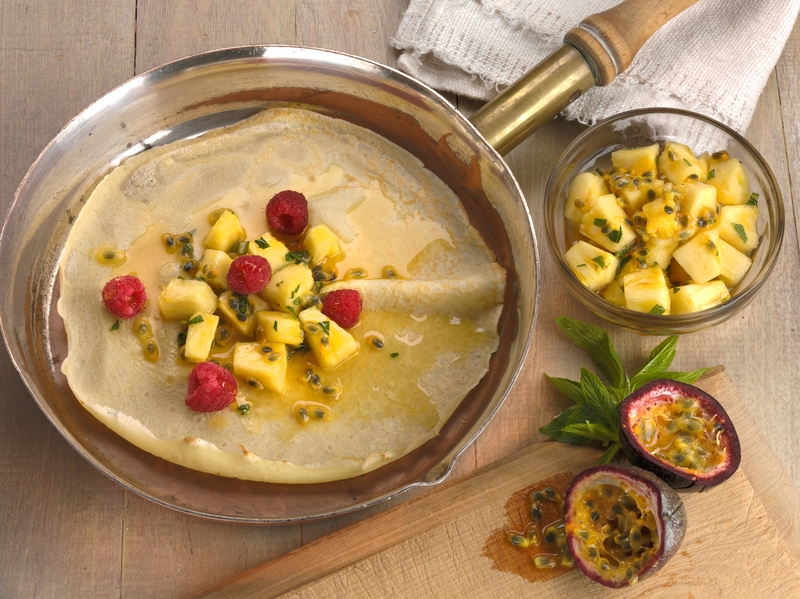 Cut passionfruit in half and squeeze over the pineapple, add raspberries, honey and mint. Fold crepes into quarters, place onto a plate and top with fruit mixture. Serve with yoghurt and a sprinkle of cinnamon. Tip: Rest the crepe mixture in the fridge for 30 minutes before use, giving the gluten a chance to relax ensuring a smooth and delicate crepe.